It's the end of May which means it's time for May favourites! We've had a really good month with lots of lovely new products to try and events picking back up again. This months favourites features products we've loved on the blog and one we haven't mentioned yet. Here's what we've been loving. I've been trying out a lot of different fragrances this month but the one that stood out the most was the Giorgio Armani Si eau de toilette. It's fresh, floral and girly; exactly what I look for in a perfume with a slightly fruity note to shake things up a bit. I've been a fan of the sheer lipstick look for quite some time but I can't stop wearing the Max Factor Colour Intensifying Balm in Classy Cherry. For the past few months I've been wearing the same your lips but better shade until this came along and introduced some colour into my routine. During the warmer months my hair gets very unruly so I dreaded the daily task of detangling until The Wet Brush came along. I'd been pulling my hair out with the tangle teezer through all the tugs so when this came along, it introduced a pain free way of hairstyling I never want to go back from. Wonderful product! You might not know this but I am a glasses wearer so this month I took a little trip to my opticians (after putting it off for far too long) and got myself a new pair from Glasses Direct. I never knew how bad my eyesight had got until I got my new pair of Glasses Direct Aspire Trillions and I actually saved around £100 by getting them online instead of the shop. Altogether with the lenses it cost me around £80 including a pair of prescription sunglasses too! I might do a future post on my experience if anyone would be interested in that. 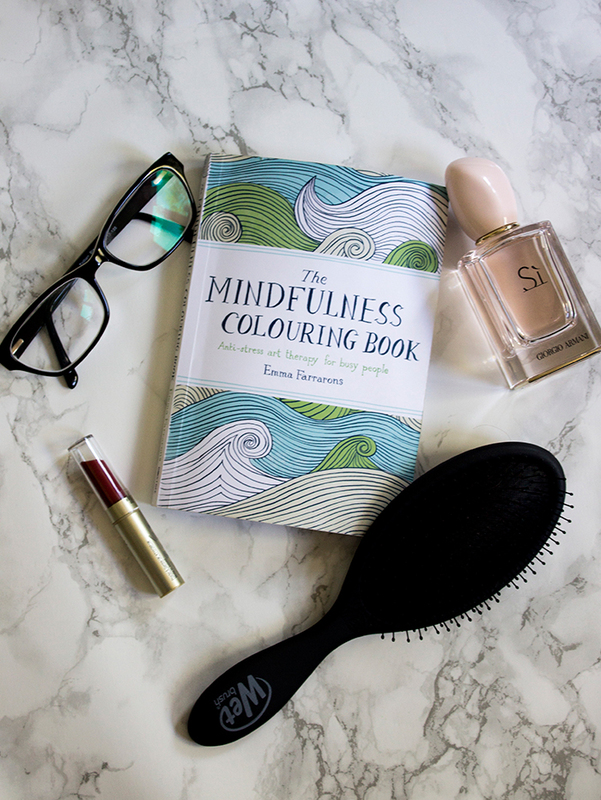 I have to give a shout out to The Mindfulness Colouring Book, the adult colouring book for de-stressing which I included in my de-stressing routine this month. It's beautifully illustrated and such a relaxing task to do when you're sitting down watching your favourite TV show. I'm around 1/3 of the way through and it's taken me ages! I'd also like to give a quick mention to the Debenhams Bra Fitting experience I received this month. Getting properly fitted made such a difference to my comfort and posture, plus it also encouraged me to get rid of all those old bra's with the wires poking out and treat myself to some lovely new sets. Those are my favourites for the month of May! I hope you all had a great month and I'd love to hear what's been your favourite this month.